This Week's Speaker is Noel Trevaskis who will speak on the topic "Australian Rotary Health"
...And Next Week's Speaker is Kirsty Kipling who will speak on the topic "Dance For A Difference"
Bucket Head, Blue Hills, Big Red and Hugah! Our meeting this week was a little unusual; we met on the foreshore for a slap up breakfast, cooked by Chris Cox and the 11th Battalion mob from Leanne’s Trench, together with members from our Sister Rotary Clubs, Batavia and Geraldton. Under the watchful eye of MC “Thinnest” Woodhams, we heard from guest speakers Bradley Millstead and Alice Steiger and enjoyed great fellowship with our Rotary mates and visitors alike, all wearing various forms of headgear! 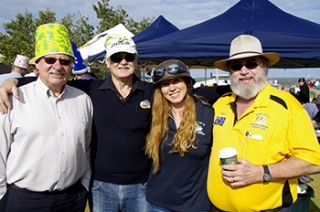 “Hat Day” is when we are invited to “Lift the Lid” on Mental Health, wearing some form of hat in supporting our very own Australian Rotary Health, in the work it does in Mental Health research. Check out the articles below for a summary of the speaker’s presentations and heaps of images taken on the day by you know who!